The BJP's multi-pronged attack followed the Supreme Court ruling on Friday that there was no occasion to doubt the decision-making process in the procurement of 36 Rafale jets from France. BJP ministers and leaders fanned out across the country Monday to allege Congress of spreading "falsehood" with an "amazing audacity" over the Rafale issue, while the opposition party gave privilege notices against Prime Minister Narendra Modi and his government -- only to be countered with a notice against Rahul Gandhi by the ruling party MPs. HRD minister Prakash Javadekar was in Lucknow to accuse Congress of committing a "sin" by "playing in hands of those who are playing with the security of the country", while Uttar Pradesh Chief Minister Yogi Adityanath held a press conference in Guwahati to ask the opposition party and its president to apologise about what he called were "false" allegations on the Rafale deal. "The actual pain of the Congress is 'how come their (BJP's) shirt is whiter than ours'," Mr Javadekar said at one of the 70 'expose the Congress' press conferences planned by the ruling party across the country in a single day. The party MP Poonam Mahajan alleged in Pune that the Congress was levelling "false" allegations to clean its own "stains" from the Bofors scam. Defence Minister Nirmala Sitharaman was in Mumbai to allege that Congress "knowingly" misled the people over the fighter jets' pricing and to allege the Gandhi family of "not listening" to the Supreme Court verdict. Textiles Minister Irani rushed to Kolkata to level similar allegations. Union minister Jitendra Singh was in Chandigarh to seek an apology from the Congress, while the BJP spokesperson Sambit Patra, in Bengaluru, accused Gandhi of having spoken "three lies" on the Rafale deal and also asked the Congress chief to listen to his "conscience and resign" over conviction former MP Sajjan Kumar in the 1984 riots case. The "three lies", Mr Patra said, were allegations of faulty pricing, faulty procurement and commercial favouritism benefiting industrialist Anil Ambani. 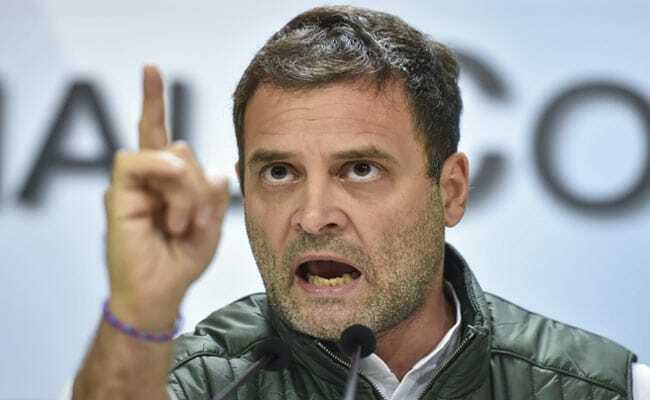 The Congress has been alleging irregularities in the multi-billion dollar purchase of the Rafale aircraft from French firm Dassault, but the government has been denying all the charges. Ambani has also denied the allegations. The BJP's multi-pronged attack followed the Supreme Court ruling on Friday that there was no occasion to doubt the decision-making process in the procurement of 36 Rafale jets from France. The court dismissed all petitions seeking an investigation into alleged irregularities in the Rs 58,000 crore deal. Mr Gandhi and his party have, however, stuck to their allegations of corruption in the purchase and demanded a probe by a Joint Parliamentary Committee (JPC). In Parliament, Congress gave notices of breach of privilege in both houses, demanding an explanation from the government on why it provided the Supreme Court "wrong" information on the Rafale deal. While Leader of Opposition in the Rajya Sabha Ghulam Nabi Azad sent the notice to the chairman of the Upper House, Congress' leader in the Lok Sabha Mallikarjun Kharge Kharge gave the notice in the Lower House. In Lok Sabha, Congress leader Sunil Jakhar also gave a notice, which he said was being moved against the prime minister for allegedly misleading the Supreme Court and Parliament in connection with the recent judgement on the Rafale deal. During the Zero Hour, Lok Sabha Speaker Sumitra Mahajan said she has received the notice for privilege motion and the matter was under her consideration. Senior Congress leader Anand Sharma alleged the government was guilty of committing breach of privilege of both Houses of Parliament by claiming that the CAG report on Rafale aircraft pricing was presented to the Public Accounts Committee of Parliament. The government has already moved the Supreme Court seeking correction in the judgment, saying "misinterpretation" of its note "resulted in a controversy in the public domain" and it did not say the CAG report was examined by the PAC or a redacted portion was placed before Parliament. Separately, three BJP MPs -- Anurag Thakur, Nishikant Dubey and Sanjay Jaiswal -- moved a notice of breach of privilege against the Congress president, alleging he spoke "falsehood" and "misled the House" over the fighter aircraft deal in his speech during a debate in July on the no-confidence motion against the Modi government at that time. In Rajya Sabha, Mr Azad was was countered by slogan-shouting from members of treasury benches, when he said he has given a notice for taking up of a discussion over the government allegedly misguiding the Supreme Court over the purchase of Rafale jets from France. Rafale jet deal issue with both sides raising slogans against each other. Parliamentary Affairs Minister Narendra Singh Tomar said it was unfortunate that the opposition members were not allowing the Lok Sabha to function. The BJP workers and leaders also held protests in several parts of the country against the Congress party over the Rafale issue.